« Don’t forget to enter the GIANNA Z. contest for book clubs! 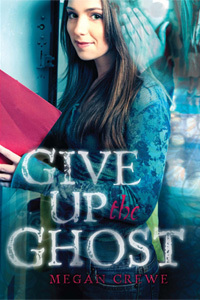 Today…Megan Crewe, author of GIVE UP THE GHOST! Welcome, Megan! Tell us about the first thing you ever wrote that made you think maybe you were a writer. When I was in fifth grade, we had an assignment around Halloween to write a suspenseful story. I loved making up stories, so I put a lot of effort into mine, which I believe was about a werewolf. My teacher picked it as an example to read to the class. I remember looking around and seeing all the other kids totally wrapped up in the story, and realizing that maybe writing wasn’t just something I loved, maybe I was good at it, too. Maybe I could be a "real" writer. Part of my bedroom is my sort-of office space: my desk, my special writing chair, bookshelves with my YA and reference books. When I have a project I’m working on, I write for a few hours every morning, on my laptop. And I’m not allowed to turn on the desktop computer with the internet connection until I’m done my goal for that day. During the rest of the day, I’m often jotting down ideas or outlining scenes in my notebook, wherever I happen to be. I read over the previous draft and make notes on things that I want to change. If I’ve gotten critiques I consult them and add any ideas from those comments to my list. Then I either make an organized list of things to change/work on in each chapter, or, if I’m making larger changes, re-outline the book scene-by-scene to work in the changes. Finally, I open a new document and start writing the new draft from scratch–though I have the previous draft open beside it so any parts I’m keeping I’m really just re-typing. The most important part of becoming a good writer is just to keep trying. Write whenever you can. Read widely so you know what’s out there and how other writers have handled different types of plots and characters. Study your stories and look for ways to make them better. Realize that it’s okay that a story’s not going to be perfect the first time you write it. Writing can be a lot of hard work, but if you love doing it, it’s totally worth it. The best part was getting to know Cass and the other characters better and better as I revised, and being about to show their stories more fully. The worst was struggling with feedback that Cass wasn’t sympathetic enough, even though she was to me and some of my readers–finding a way to soften her up without losing the edge that was so important to her personality. But I think I’ve managed to do that! Sixteen-year-old Cass McKenna would take the company of the dead over the living any day. Unlike her high school classmates, the dead don’t lie or judge, and they’re way less scary than Danielle, the best-bud-turned-backstabber who kicked Cass to the bottom of the social ladder in seventh grade. Since then, Cass has styled herself as an avenger. Using the secrets her ghostly friends stumble across, she exposes her fellow students’ deceits and knocks the poseurs down a peg. When Tim Reed, the student council V.P., asks Cass to chat with his recently-deceased mom, her instinct is to laugh in his face. But Tim’s part of Danielle’s crowd. He can give Cass dirt the dead don’t know. Intent on revenge, Cass offers to trade her spirit-detecting skills for his information. She isn’t counting on chasing a ghost who would rather hide than speak to her, facing the explosive intervention of an angry student, or discovering that Tim’s actually an okay guy. Then Tim sinks into a suicidal depression, and Cass has to choose: run back to the safety of the dead, or risk everything to stop Tim from becoming a ghost himself. Thanks for joining us, Megan! You can read more about Megan at her website. You can pick up your copy of GIVE UP THE GHOST at your local independent bookseller, order it through one of my favorite indies, Flying Pig Bookstore (they ship! ), or find an indie near you by checking out IndieBound!